The average score of the managers in GW22 was 64 taking into account point deductions for extra transfers. That’s compared to the game average of 49. That’s 15 points and 30% above the game average score. High score of the 10 was 76. The low score was 54. A relatively high spread of 22 for an quite low scoring gameweek. The average overall rank of the top 10 FPL managers is 39k an improvement of rank from last week of 41k. The best overall rank is now around the top 50 and the lowest 127k. The top 10k captain choice (from the excellent free site FPL discovery) was 54% Salah and 28% Hazard and Aubameyang 6%. The FFGeek poll this time wasn’t too far off the top 2 at least. I suspect the FPL managers will use the 2nd wildcard either just before or during a double gameweek. See my article on where these are likely to be. This is where teams play twice due to FA Cup postponed games being put into other gameweeks. 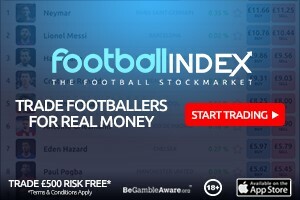 The top 10k average score was 63 compared to the 10 top managers average of 64. However there is no one who fits within that difference criteria and the top 10 FPL managers and the top 10k are very similar with only defences offering even a moderate difference. So that’s 9 essentials and 1 maybe. This leaves room for 5 differentials/bench two pointers. This manager is currently 127k OR and 1302 points. His team value is £105.6. A good score this week of 67. So of the template he has Doherty, Liverpool defence, Wan Bissaka, West Ham defence, Salah, Pogba, Richarlison and Kane. So he has 8 of the 10 template. His template replacement for Digne is double Liverpool defence. Unfortunately Lovren was injured GW22. His template replacement for Hazard I would say is Aubameyang. The bench players are Romeu, Button and Bednarek. That makes 13 leaving only 2 pure differentials in Martial and Rashford. Although the template replacement players are also differentials. It’s not definite re the Kane injury yet I don’t think. But yes, either Aguero or Jesus as a direct replacement? It’s a shame Jesus got a brace last night cos now it is hard to call. I think Aguero would definitely have started this weekend if Jesus had blanked. Also rumours about TAA sideline for around 4 weeks with knee injury! I just brought him in! It could be worse. I already went Alonso to Digne so I’m looking at minus 4. I do like Kane to Rashford and triple utd for the next few. It does mean 6.6 itb though. Pretty sure Kane is out for a while. I’ll triple up on Liverpool or utd. so u don’t have taa then currently? just kane who isn’t confirmed injured just yet. 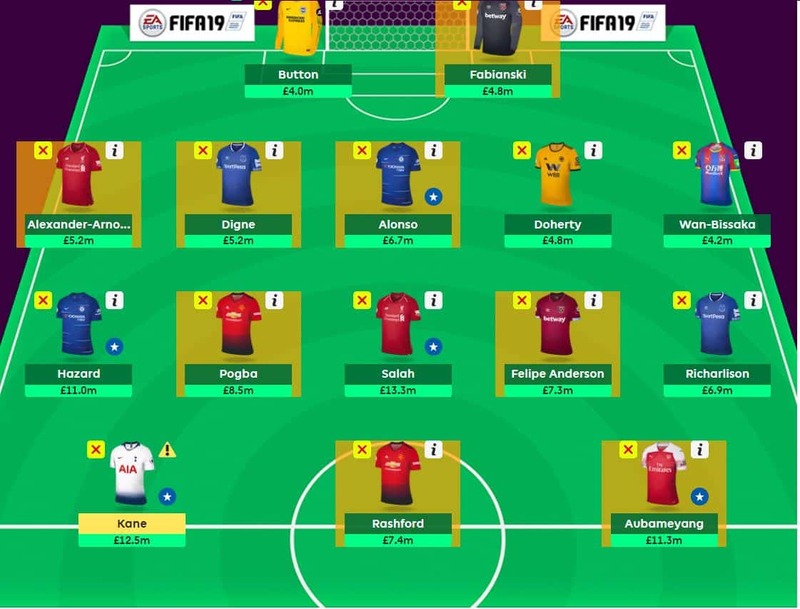 I’ve taken the 4 point hit for Alonso and Kane to Digne and Rashford. 5k atm but the its so tough to maintain rank with a hit. 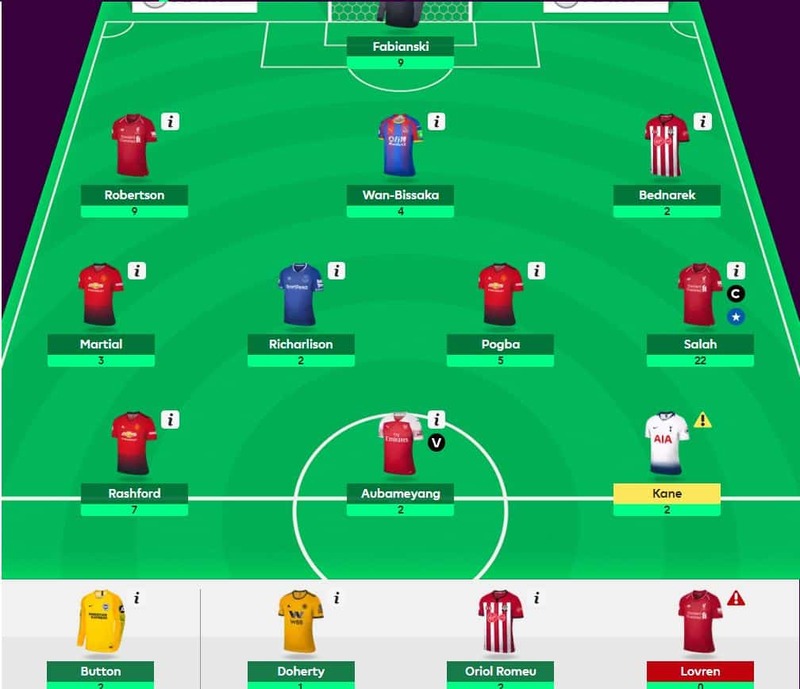 I already have Rashford and Auba, I also have taa. So need to do Kane and taa for X and X.
I am thinking i will replace taa for another liverpool defender, probably gomez who seems to be back this week. And Kane to Aguero. But that is risky… could also do Jesus. No other obvious replacement for Kane really aside from the City boys. I dont like Jiminez really, although guaranteed to play. I guess Firmino could be an option. He’s not exactly been on fire though. Thanks for advising me not to play the wc last week. Had a nice fat green arrow too. Still 120k behind my personal best though. What do you think of Kane for firmino? Possibly a good differential and Liverpool has some nice run of games ahead? Or since I don’t have any man city attacking representation, would be be advised to get aguero instead? I feel Jesus started last game because of his ‘illness’ but I think aguero is his main man. The keyword here is – think. I also prematurely transferred auba for rashford on Monday to gain the price increase not realizing Kane’s injury might be this serious. I was split 50/50 between Rashford and Firmino. Both were good options imo. City have 2 away games next. That, allied to form would lead me to think Jesus is the better option. Aguero did score 3 against Huddersfield last time but his best away scores are 6, 5, 4 and home 20, 13, 8. Jesus or Firmino? Have another hit and get them both. Take a -8 for firmino and Jesus? That’s a scary thought seeing that Jesus starting 11 is still a speculation and if anything he is going to share minutes with aguero. I think I will wait another week and see if Jesus can hold his spot. After typing this I am inclined for Kane to firmino (-4) and see next week which city asset to get. Will have the funds to get either.. Hoping it’s aguero then it will be easier for me later on to get auba or Kane.